Responding to significant enrollment growth over the past ten years, the Palmyra Area School District is proactively approaching and enhancing the student experience. 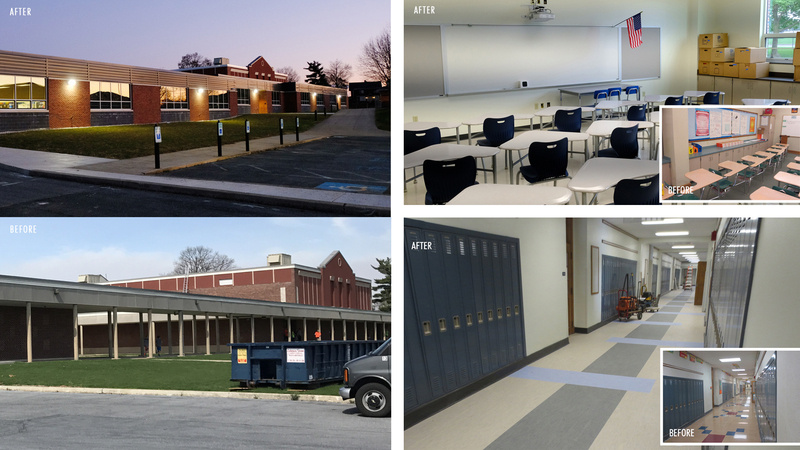 Addressing numerous facility deficiencies at the Middle School, the District recently finished a two-phase, multi-year addition and renovation process. Much of the process was completed using a GESA process (Guaranteed Energy Savings Act) administered through Reynolds Energy Solutions. Phase one focused on modernizing all of the energy-consuming systems and equipment within the building. Reynolds Energy Solutions provided new mechanical, plumbing and electrical upgrades with SG providing finish and ADA upgrades to the existing building. By replacing decades-old equipment, fixtures, and lights, the Middle School is now poised for operational efficiency in the coming years. Other upgrades during phase one included architecturally new or upgraded materials to hallways, classrooms, ADA upgrades, roof replacement, window replacements and exterior restoration throughout the entire school. Mechanical, Electrical and Plumbing upgrades included new corridor LED lighting, new HVAC system throughout Phase, replacement of all toilet Fixtures, flush valves and faucets, replacement of all water fountains and new emergency generator. Phase two addressed the District’s physical/spatial needs by adding twelve classrooms, small-group instruction space, a faculty room, and new toilet rooms. The cafeteria was modernized and expanded to include an outdoor dining area. 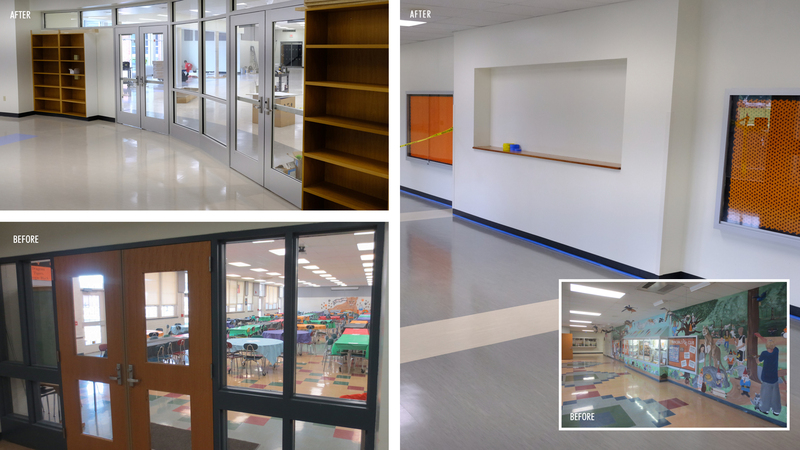 Several rooms within the existing building were reconfigured to function programmatically with the District’s current and growing needs. Finally, the Administrative suite received an organizational facelift including a new secure entrance portal. Renovations to the remainder of the existing School also included: New bleachers for the existing gymnasium, floor leveling of the existing band room to meet ADA, conversion of large group instruction classroom into two new classrooms, replacement of all existing exterior doors, new signage throughout the school, elevator upgrades to meet current codes and new secure front entrance vestibule. SG is proud of our partnership with the Palmyra Area School District and Reynolds Energy Solutions and excited to continue working with them on several other building modernization projects. 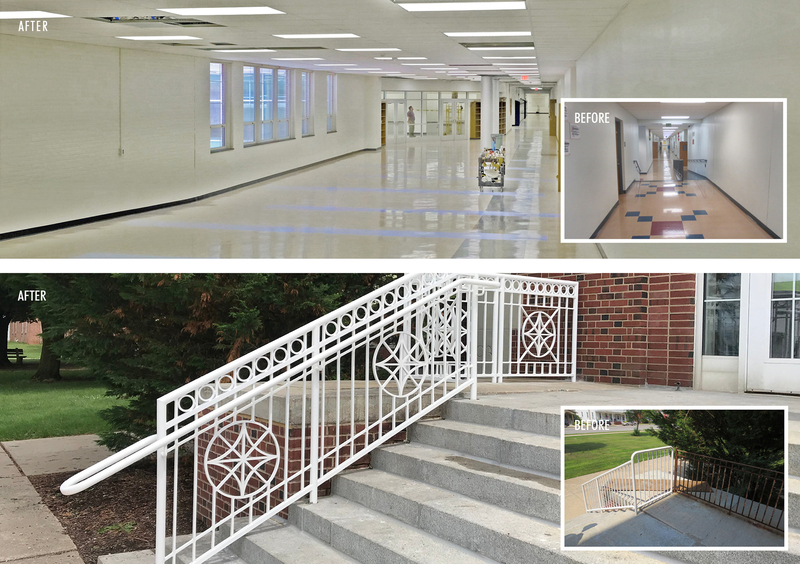 Check out our other K-12 projects here. Ready to start a project? Let's chat. Copyright © 2019 Schradergroup. All Rights Reserved.